Happy 137th Birthday Mr Shepard! 98 years ago today – 10th December 1918 – on his birthday and whilst stationed in Italy at the end of WWI, we know that E. H. Shepard spent time with American writer Ernest Hemingway. 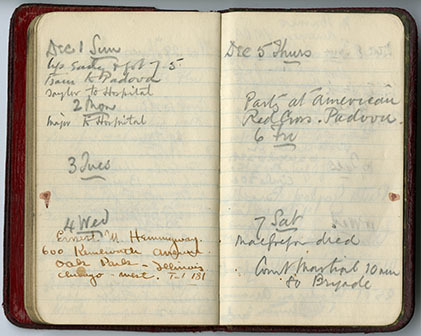 Shepard’s letters and manuscripts reveal that he met a young Hemingway, aged only 19, in Italy in 1918. Initially he met him in Milan in the Red Cross hospital; historical accounts confirm that Hemingway had been badly injured on 8th July – although Shepard says to his wife “he was wounded in 32 places in the June show here” – and spent 6 months in hospital. In his wartime recollections (Ref No: EHS/H/24/9), Shepard recounts how Hemingway had lifted up his pyjama leg to show his injuries. But more than that, how Hemingway had complained the nurses had taken away his drink but that he had still managed to dodge the matron and revealed a stash of bottles under his bed. 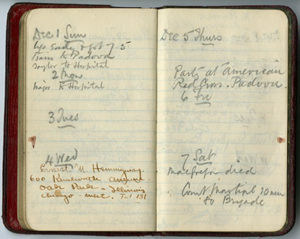 We know that Shepard had also taken Hemingway’s address in America as it is in his diary for 1918. Confusingly, Shepard’s letters refer to the period 8-10th December 1918 as seeing Hemingway again but the address is written under Wednesday 4th December.